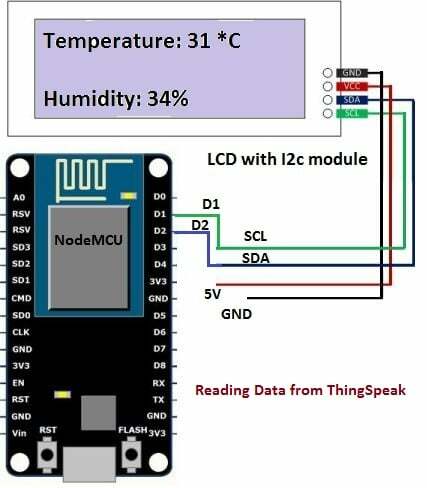 In this post we are going to learn how to read sensor data from Thingspeak using generic ESP8266 and Arduino and also using NodeMCU. We will learn how to fetch the uploaded data and print it on serial monitor and also on 16×2 LCD display. Reading values using generic ESP8266 and Arduino. Reading values using NodeMCU with serial monitor. 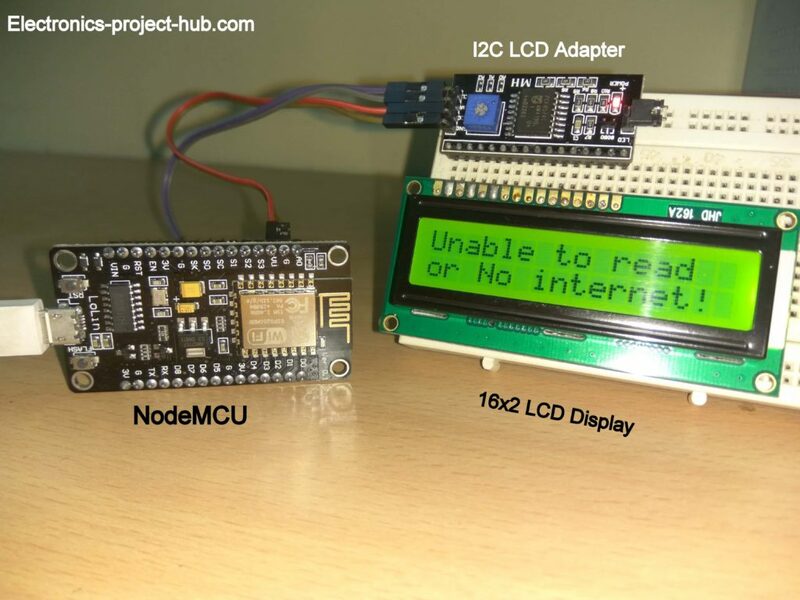 Reading values using NodeMCU with LCD display. To read values from Thingspeak we need to upload some data in real time, to do this, I am uploading temperature and humidity data to Thingspeak using GSM. 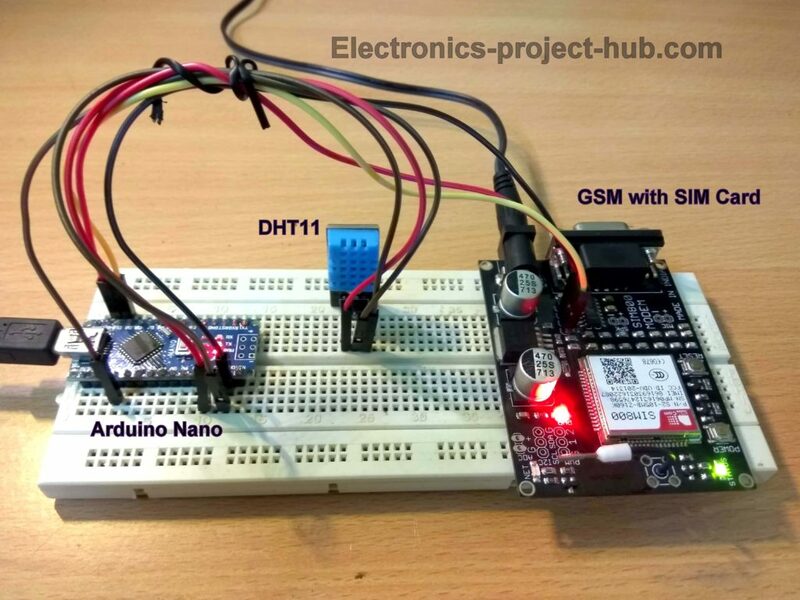 You can upload data to Thingspeak using ESP8266 or NodeMCU, I choose to upload data using GSM because I had just one Wi-Fi network at home and I don’t want to send and receive the data on the same Wi-Fi network, so that I can show you guys that a faithful data transmission and reception occurred via Thingspeak and not data transferred locally in a Wi-Fi network. If you are enthusiastically landed on this post, then probably you already know how to send data to Thingspeak, if not please check out the links below after you finish reading this post. 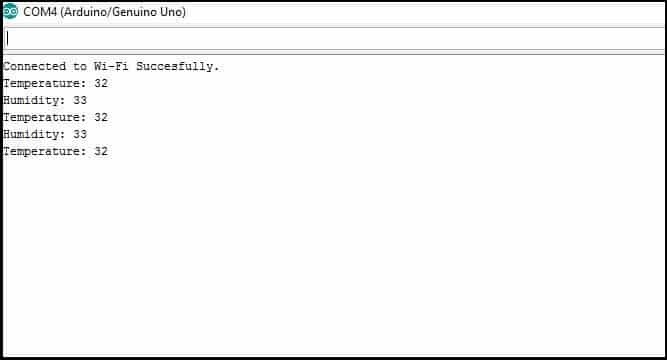 1) Send data to Thingspeak using GSM. 2) Send data to Thingspeak using ESP8266 and Arduino. I am going to send data to two fields: Temperature and humidity. Below is the circuit setup what I have used, you can checkout circuit diagram and program code in the first link given above. Go to your Thingspeak account and do the following setting to receive temperature and humidity data. Scroll to the bottom of this page and press save to save your settings. 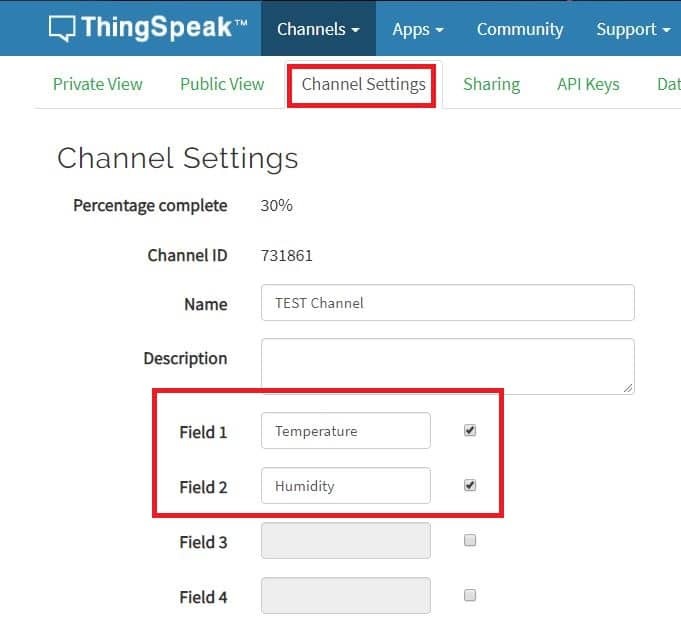 Now you need to collect some information from your Thingspeak account to receive data from your channel, these channel information will be entered in the program code. You need your channel ID to read the fields on your channel you wish to read. 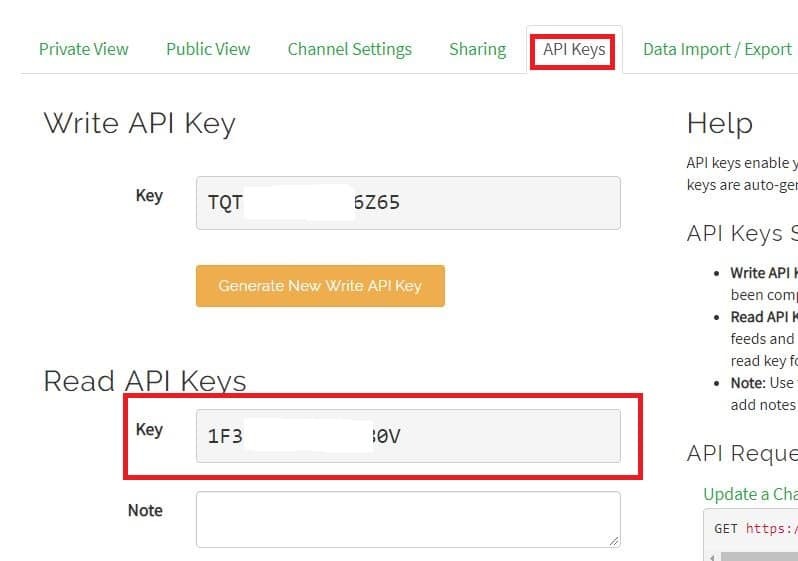 You need your read API key of that channel. Here I am going to use an ESP8266 module and an Arduino board who’s microcontroller IC is removable. We need to upload a program to ESP8266 module to read data from Thingspeak; the Arduino board will receive and display the data on serial monitor. 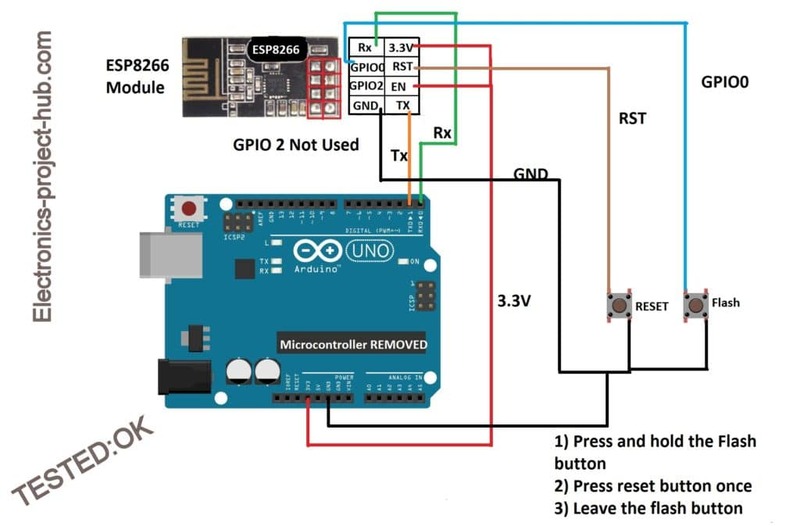 You need to wire-up the circuit as illustrated above and upload the given code to read data from Thingspeak. The IC must be removed from the Arduino board. 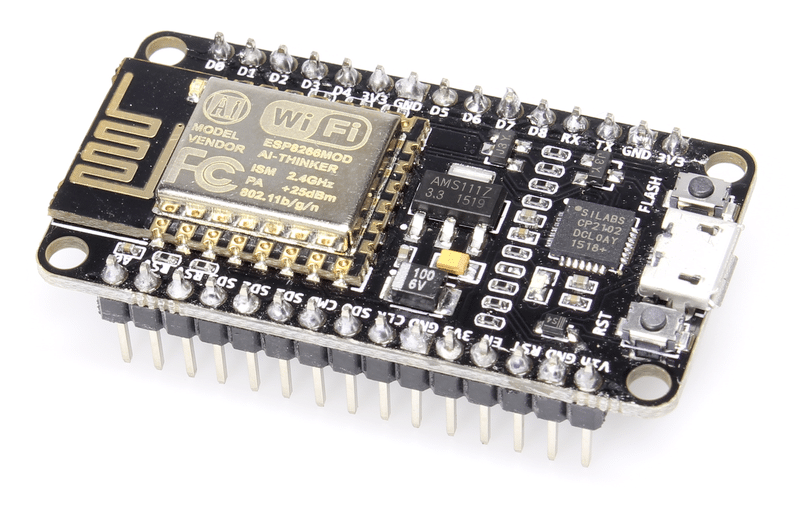 You should have the ESP8266 package installed on your Arduino IDE, if not click this link and read this topic: How to install ESP8266 board package to Arduino IDE? Now Press and hold the flash button, using another finger press the reset button for a second and leave it, after this you can leave the flash button, this will make the ESP8266 module ready to upload a new code. Select “Tools” > “Board” > select “Generic ESP8266”. Select the correct COM port. Select the baud rate to 115200. Walla! 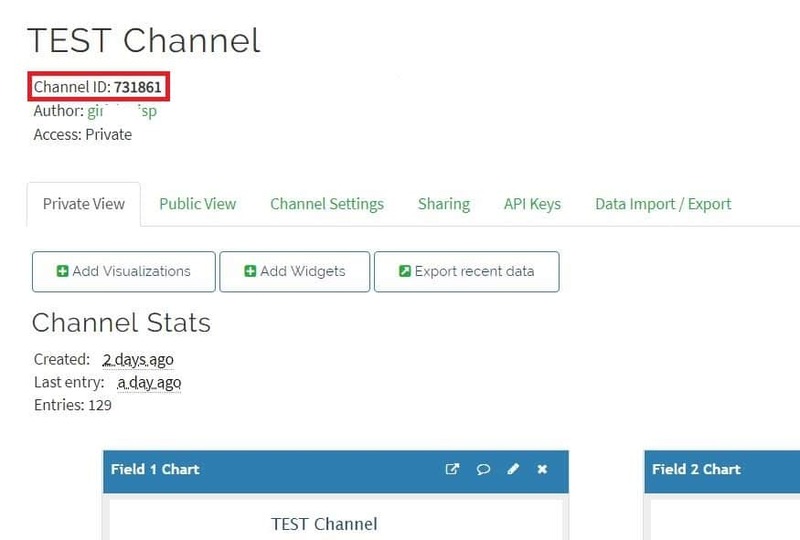 Now you successfully read data from your Thingspeak channel. 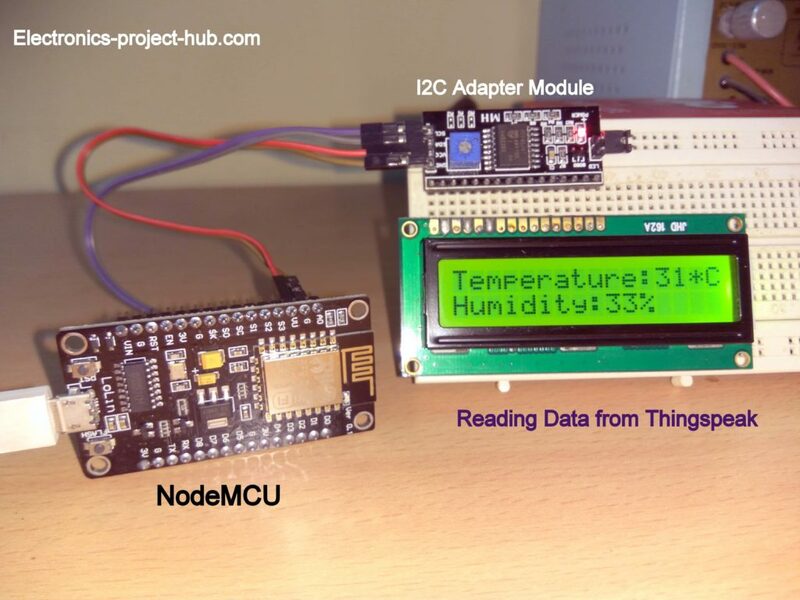 In this section we are going read data from Thingspeak using NodeMCU and see the data on the serial monitor. Note: We are uploading the same program code to NodeMCU which we uploaded to generic ESP8266 previously. Connect NodeMCU to PC via micro USB cable. 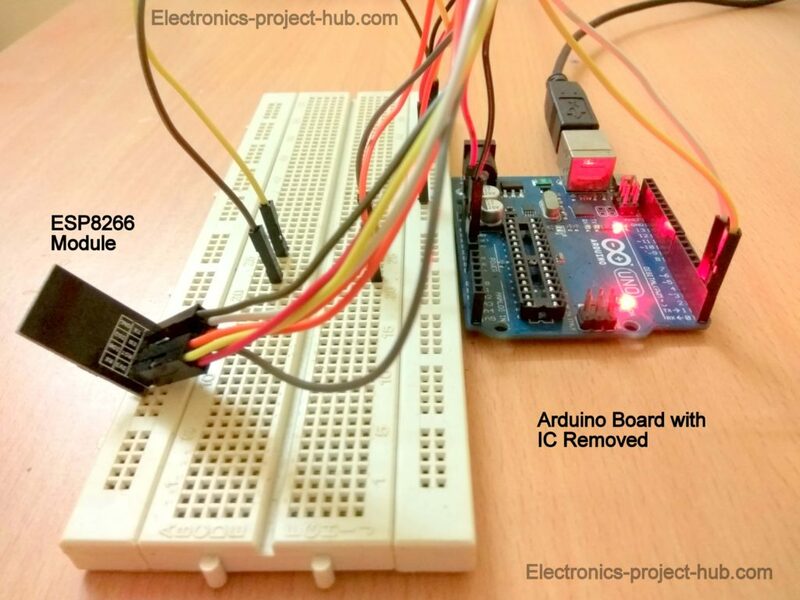 You should have ESP8266 package installed on your Arduino IDE, if not click this link and read this topic: How to install ESP8266 board package to Arduino IDE? To make your NodeMCU ready to upload a new code, Press and hold the flash button, now press the reset button for a seconds and leave it. Now leave the flash button. Open the serial monitor; you will be able to see the values read from your channel. 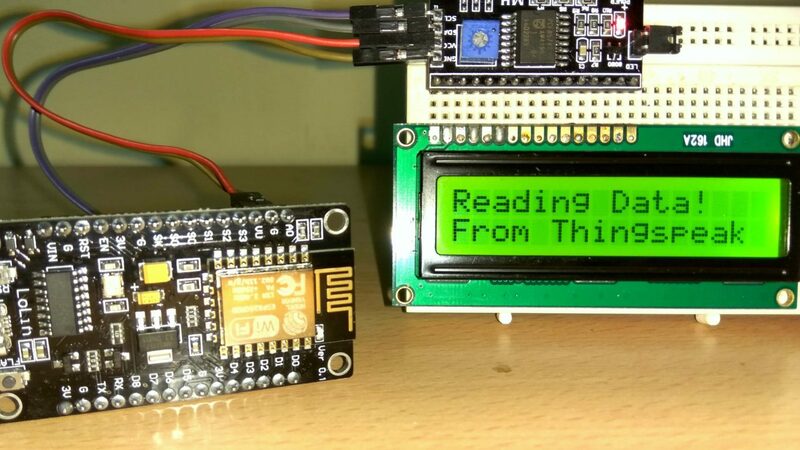 In this section we will see how to read Thingspeak channel data using NodeMCU and 16×2 LCD display. To make things easier I have used I2C module for LCD which will reduce the wire connections to 2 wires (SCL and SDA). The circuit is self-explanatory, D1 is SCL and D2 is SDA which need to be connected with respective terminals of I2C module. The I2C module need 5V supply which will be provided by Vin pin of the NodeMCU, if you are powering it via USB. Note: If you have LoLin V3, Vin pin does not provide proper 5V but “VU” pin provides 5V). 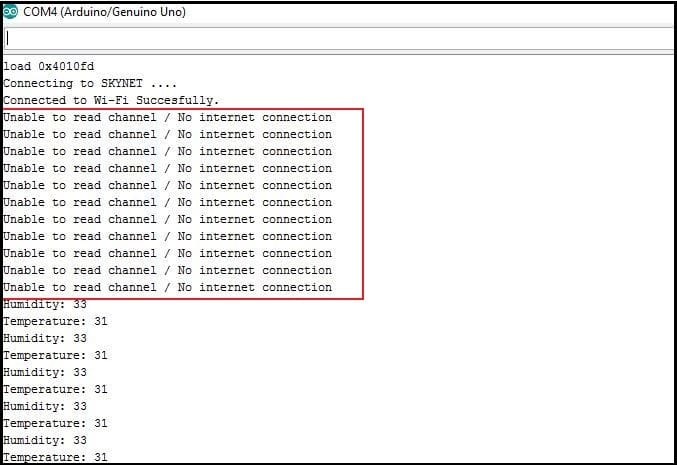 Now upload the code using previously given instruction for NodeMCU; on successful code upload you will be able to see the data from two fields of your channel. While uploading the program code to NodeMCU, a warning could popup saying that I2C library is written for AVR architecture may not work with ESP8266 NodeMCU, please ignore this warning. You may find that serial monitor or the LCD saying “unable to read / no internet” when you power your circuit. This is normal it will take some time to read your channel, be patient wait for couple of minutes or so, sometimes it read right away. If this error message persist for more than 4 minutes, please disconnect the power and reconnect it after few seconds. Once it updates value, it is the latest value uploaded by the sending device. What will happen when the uploading circuit goes offline? The last updated value will be read again and again by the receiving circuit. How long will it take to update a new data on the receiving circuit? With a decent internet, it should not take more than 30 seconds [sender uploading data to Thingspeak and read by the receiving circuit]. Usually it will take less than 20 seconds. If you have any questions regarding this project, feel free to say in the comments, you will get a guaranteed reply from us.